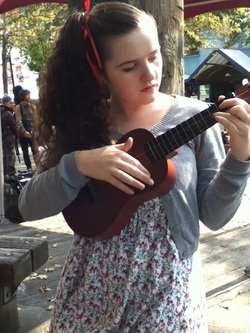 I love to sing and play my ukulele, and I perform at Granville Island, busking on most weekends (rain or shine). I also regularly get asked to play at different venues around Vancouver. I've been hired to play at special events, community centres, stores, and once I even played at a farm standing next to the sunflowers! Here are some YouTube videos of my musical performances at different events. Busking in the pouring rain in Triangle Square at Granville Island, while singing "Brother Can You Spare a Dime"
Getting a little help from "The King of the Ukulele", Ralph Shaw, on my cover of the 1931 hit: "Got a Date With an Angel".